Greetings friends and fellow crafters. I'm here today with a card that I made using paper and inks from Quick Quotes and a stamp set from Joy Clair. I stamped the ship image with Mocha Mama and set aside to dry. I then went to work with the base panels. The main panel cut from Chiffon is 4.5 x 5.75. I then made a smaller layer of 4.25 x 5.5 from Adventure Awaits. A panel of white that had been run through an embossing folder and cut to 3.75 x 5 was attached next. A layer from Adventure Awaits was cut with a 4.5 diameter circle die, followed by another piece fo the Chiffon cut at 1.25 x 3.75 with banner tails, I then cut Adventure Awaits again at 1 x 3.5 to make a smaller banner tail. 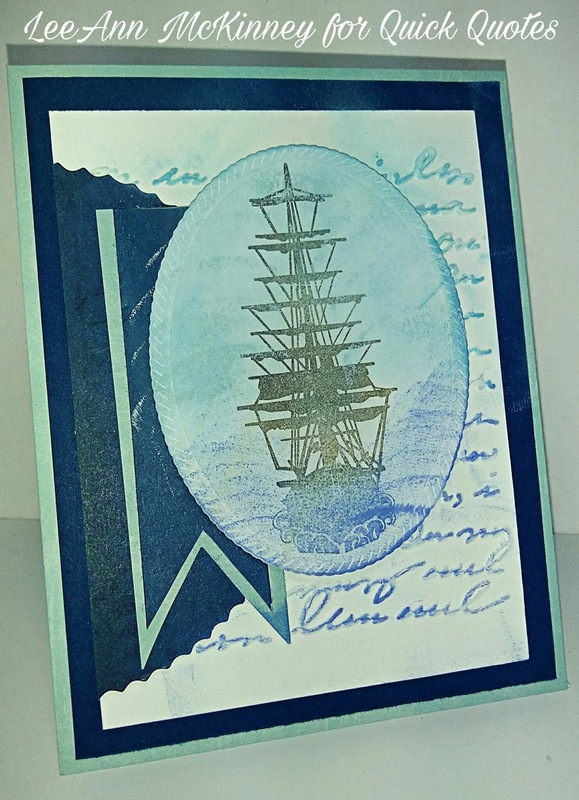 Now that the ship is dry, I used Royal Blue for the water, and Sky Blue for the sky, both on the image panel and the embossed sheet underneath so that it all flows together. What a great nautical card! Love the tall ship!